2010 Governor's Council on Physical Fitness Physical Educator of the Year! Mrs. Lindsay Robinson Beaton was selected as the 2010 Governor's Council on Fitness Physical Educator of the Year. An award ceremony and dinner was held at The Peabody Hotel in Little Rock where Mrs. Lindsay was presented with her award by Arkansas First Lady Ginger Beebe and Chair of the Arkansas Governor's Council on Physical Fitness Dr. Blair Dean. Mrs. Lindsay Robinson Beaton was selected as the 2009 - 2010 Arkansas Association of Health, Physical Education, Recreation & Dance (ArkAHPERD) Elementary Physical Education Teacher of the Year (TOY). As the ArkAHPERD Elementary TOY, Mrs. Lindsay is eligible to become the Soutnern District of the American Alliance of Health, Physical Education, Recreation and Dance Elementary Teacher of the Year! An award ceremony was held in honor of all the ArkAHPERD award recipients at the 2010 Arkansas AHPERD State Convention, November 2010. 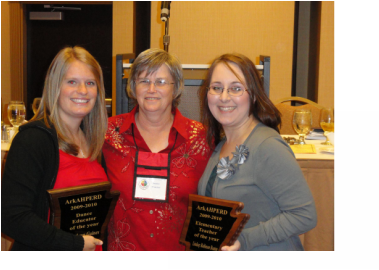 Pictured at left is Miss Cathryn Gaines, ArkAHPERD 2009 - 2010 Dance Teacher of the Year, Mrs. Jeanie Strasner, former ArkAHPERD Elementary Teacher of the Year and Mrs. Lindsay Beaton, ArkAHPERD 2009 - 2010 Elementary Teacher of the Year!